This is where you can buy handmade soap that is free of SLS. No animal products, no artificial preservatives, and no detergents of any kind are used by BodyWareSoap.com. Our skin is the largest living organ of our body. It requires attentive hygiene and daily nutrients for health. With this in mind we have developed a technology for saponification that yields a basic soap that provides nutrients to the skin upon washing. Our soap contains the finest natural ingredients available today. Each bar is handmade and takes a full three weeks to cure. 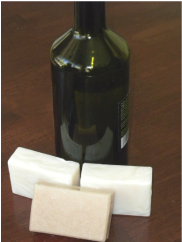 We use not only castille soap ingredients of olive and palm oils, we add healing oils of avocado and jojoba, as well as shea butter and grapefruit seed extract. Many of our recipes include organic plants and flowers, organic honey, oatmeal, and even tea extracts and essential oils to yield a wonderfully scented, soothing, and emollient bathing experience. Since we use no SLS (sodium laurel sulfate} and no animal products, no artificial preservatives, and no detergents of any kind, our soap is non-comonegenic and allows the skin to breathe. Our soaps lather readily and render a more wetting and cleansing action followed by a completely moisturizing rinse that can be felt on first use. Because we incorporate healing oils in our soaps, daily use will allow the skin to maintain its dermal layers in thick robust luster. This will become apparent upon regular use. To provide nutrients to the skin via soap in a natural way without stripping the skin of its normal balance is our constant aim. With daily use only the oils the skin needs will remain at rinse. Just enough each day to protect and nourish the skin.